The up front licensing costs are actually the simplest part of the story, from here it gets a little tricky. Given the 6-24 months ARM says it typically takes to negotiate a licensing deal you can probably guess that they are pretty comprehensive. Picking which type of license you want to buy is the work of an afternoon, once you get the lawyers involved things slow down. A lot. The complexities start out with the royalties, and this area is where ARM makes most of its income. Update 8-12-13@4:05pm: All royalty figures in this article are based on the author’s analysis and calculations. ARM only stated that, historically, the royalties were in the 1-2% range, then talked about adders and relative modifiers. The license types just get you a design, actually making silicon that contains the cores in question involves royalty payments to ARM for each device sold. These are typically 1-2% of the selling price of the end chip or SoC but ARM has indicated that the V8 class chips will raise this a bit. That means the A53 and A57 will have a maximum royalty rate of 2.5% and likely a higher minimum too but both numbers can vary a lot within some rough guidelines. There are a few general trends to consider, the first is that as you go up the initial license pyramid fees go up. As they do the royalty rates go down a bit but given the narrow ranges it isn’t a massive change to the gross price of a device. It is pretty reasonable to think that if an architectural licensee that makes their own core they would pay a bit less than someone who uses an entire ARM designed core. Similarly the number of cores licensed by a company is likely proportional to the quantity of SKUs shipped so lowering royalty rates can effectively be a volume discount too. ARM did not explicitly comment on volume discounts be they number of products or quantity of a single product but SemiAccurate has heard that there are some rate differences between the big guys and those shipping orders of magnitude less volume. If the ranges ARM gave out are correct this is less than 1% of the SoCs MSRP though so it is unlikely to be a major competitive advantage for anyone. Similarly as you go up the complexity chain from an M0 ‘shoelace tip controller’ to a 64-bit multi-GHz A57 the work ARM needs to do to enable that goes up. License fees increase but so do the royalty rates, both reflect the work ARM did or needs to do to design the cores, get these devices to market, and reflect the value that the cores bring. Remember that ARM tries to recoup the design cost in the first 10 licenses so if costs go up…..
From a development perspective you could probably replicate the functionality in a 12K gate Coretex-M0+ without too much effort on your own. If ARM charges more than that development cost in licensees and royalties customers will just design their own. On the other hand there aren’t that many companies that can do a core on the level of the V8 A53 or A57 for a reasonable cost and have enough volume to make a net profit. Additionally if a company does make their own designs it wouldn’t run ARM software so there is that hill to climb too. Complexity puts both an upper and lower bound on what ARM can charge as does the software ecosystem. If they ask too much it is cheaper for a company to make their own within some limits. So far the royalty rates don’t seem to be all that complex, they just follow some basic economic fundamentals like volume discounts and cost being relative to work put in to making the good. So what happens if you put in multiple different cores in to a single device, the simplest case being big.little with an A7 and an A15? Single core SoCs vs dual or quads? How about AMD putting an A5 in to their Trinity/Kaveri/PS4/XBox One chips? What if the SoC is never sold per se like Apple or Samsung using their own silicon for their own phones? Remember those lawyers and the 6+ month license negotiation times? This is where things start bogging down even though some parts have a simple answer there are more hidden complexities than you can imagine. The simplest of these cases is the multi-core SoCs. Initial license fees cover what constraints there are in using the core in products, mainly how many times you can use the design. In return you get the design and IP and that does not change regardless of whether it is turned into a 1C, 4C, or 923C SoC you pay the same license fee. If this doesn’t make sense think about royalties. A 1C A15 SoC isn’t going to sell for very much on the market today, a 4C high end phone SoC will, and a custom 32-core base station device will be a tad spendier too. All three designs will pay the same license fee up front and lets assume all pay the same royalty rate too. ARM will get proportionately more for the 32-core than the 4-core and the 1-core will bring in less than the 4C too. Why? They sell for more and ARM gets a percentage regardless of whether it is a $5 ereader SoC or a $10K+ base station controller. What about big.little configurations? Once again it is the same, a percentage off the top. The licensee pays a discounted license fee for the initial IP and then things get complex. For an A7 + A15 configuration you wouldn’t pay the hypothetical 1.5% license fee for an A7 and then another 1.5% for the A15 for a total of 3%. Instead you would pay the rate for the bigger chip with a lower adder for the little processor. How much lower ARM wouldn’t say, for some reason they were reticent to divulge their entire fee and royalty structure to a room full of journalists. Next time we ask we will bring cookies to butter them up. In any case think of the .little as a discounted adder not part of a full stacked royalty structure. When you start talking about chips where the ARM core is only a small part of the overall functionality thing get more than a little complex. If the AMD XBox One SoC is a 300+mm^2 device and the A5 core in it takes up less than .5mm^2, what percentage of that is based on area? If there are 4+ AMD Jaguar cores in it as well, what percentage of the functionality of the device is that A5 core? If Microsoft pays a hypothetical $50 for these chips, what is a fair royalty for ARM to charge? If ARM asks for a lot AMD is more than capable of making their own controller core to do the security functions or they can just license someone else’s core. This is where the royalty negotiations go from a phone call like, “Hi Warren, this is Dirk. I am in a Starbucks with Whispering Steve (cue background Chewbaca noises) and while we were waiting for the sprinkles to be put on Steve’s Frappuchino we decided to slap an A5 in to the next XBox part. We decided on a one use license for it while drinking, and now we want to know what this might run us.” Technical decisions, 19 minutes. License done and dusted, a year+. 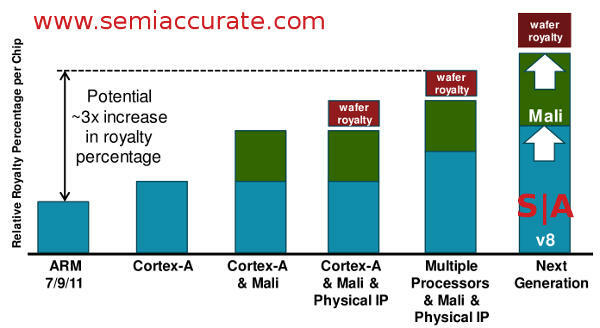 What the royalty rate for ARM is will probably never be known but you can be sure it is far less than 1%. ARM was quite clear that this type of scenario is a complex case by case basis negotiation where everything is looked at, something that is obvious in cases like this. There are no hard and fast rules and probably even no guidelines as to what is taken in to account. Any number is only applicable for that specific scenario, game consoles, airliner parts, and HVAC widgets have very little in common. Don’t forget it has to take a 10-year lifespan with numerous shrinks, derivatives, and potentially feature updates in to account as well. It is neither quick, simple, or generalizable. The last case where the device maker uses their own chips, ones that are never sold on the open market to anyone internal or external, are yet another simple sounding one. ARM simply charges them the applicable royalty rate based on what the device should sell for, easy right? Sure, but figuring out what that device should sell for is a vastly more complex question. What if a company like Samsung only charges their internal device division absolute cost for chips instead of what they would pay on the open market. What if the phone guys only have to pay for the cost of running the wafer, none of the R&D, overhead, upkeep, and depreciation? How does ARM compute this? Once again the answer is, “it depends”. Things devolve into a case by case negotiation over business models, competitive parts, and dozens of other things that make strong men weep. For the record, lawyers don’t feel pain like we do so they are OK here. No two deals are probably the same but unlike the XBox example above, there are probably guidelines to work from. A 28nm wafer probably has an associated open market value based on area used and devices put on it so you can ballpark an in-house value with much more ease than the XBox. As you might expect, ARM isn’t commenting on specifics but this type of example probably has a fair amount of internal guidelines to work with. One more loose end to deal with is revisions to a core. Once a core like an A9 is released the work does not stop there, ARM needs to port to many processes and even lay it out for new foundries. Along the way there are some architectural updates that get made, bug fixes, performance enhancements, area shrinks, or even added features like multi-CPU or big.little support. These get rolled up in to an updated core that looks the same from the outside but does things a bit better on the inside. These revisions do command an added fee from the licensee but ARM was not specific about how much other than not a lot. Think of revisions as a very small optional cost adder to the license fees rather than the royalties. Just when you thought the license fees and royalty structure was making sense there is one more wrinkle called physical IP or POP. POP is sold by the Artisan division of ARM and the customers are not the traditional arm licensees, they are the foundries. The idea is that ARM takes a select number of their cores and lays them out for a specific foundry. Instead of licensing a core design that will be added to by the customer, they eventually get a pre-laid out core that is optimized for the process they want to use at the foundry they want to use. Currently there are only a handful of designs, the A5/A9, A7/A15, A53/A57, and Mali T628/678 GPUs. In essence you can get a pre-rolled copy of the last three cores and the latest GPU to play lego blocks with at several foundries. The end customer doesn’t have to do the work of laying out the device and if the foundry has more IP partners with similar offerings the customer can almost play Lego with IP to make a complete SoC. It isn’t quite that simple but it does lower the bar quite a bit for end customers in theory making SoC design available to a wider audience with lower technical capabilities. If you are going to build an SoC with one of the offered cores at one of the participating foundries, why wouldn’t you use the pre-rolled version? The answer there is simple, cost. This is where things get interesting again, the cost is easy enough to calculate at about 1.5-2.5% of the wafer cost paid by the foundries. Yes the customer is not the licensee the foundry is, but you would assume one needs to be an ARM licensee in good standing to get access to said wafers. While this wasn’t explicitly stated the other way makes no sense. This cost is in addition to the royalty rate, and ARM estimates that it will add about .5% to the cost of a chip in the end. For a $5000 28nm wafer, POP would add a maximum of $125 to the total. I know what you are thinking now, how do the Mali GPUs and other ARM IP offerings fit in to this whole scheme? As you might have guessed they are all just cost adders, some have a license fee as well but all add a bit to the royalty rate. How much? It depends on the situation, what GPU or IP you are adding, and to what. Some competitors accuse ARM of doing dirty tricks to force their GPUs on to the market but without any hard numbers from either side it is all just hearsay. One would assume that the more you license the bigger the discount gets but there are no real hard numbers floating that SemiAccurate can find. Update 8-13-13 @ 9:50am: Minor wording changes for clarity.